Sunspots is both my latest poetry collection and a new touring live show. It is the result of four years of writing, travelling, researching, and obsessing over our neighbourhood star, the Sun (or Sol as I usually call her). The book is published by Penned in the Margins and the show is also produced in collaboration with Penned. The best place for updates as we tour is over on my blog page. His project goes under the name of 'Sunspots' and p.o.w. 17 showcases two of them. As with Sam Winston, Barraclough makes full use of the expanse of space across six panels. 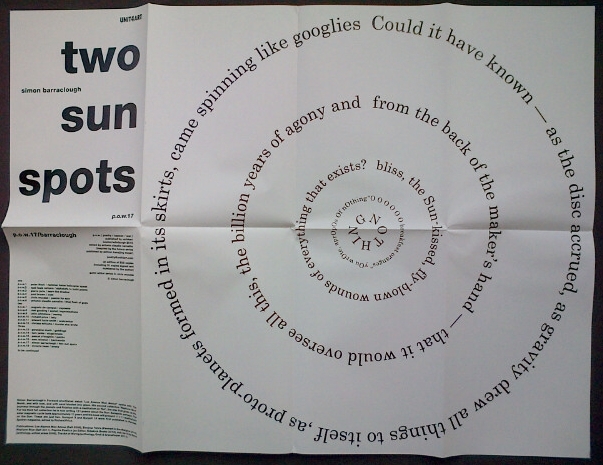 There is a wonderful sense of bathos at play in this broadside, the first sun spot invites the reader to follow its circuitous text describing how the sun was formed across "the billion years of agony" at which point we arrive at the sunspot in the centre, offsetting "breakfast oranges" against nothing. It is a wonderful O'Hara-esque exercise in offsetting the macrocosmic against diurnal everydayness. There are more of his planet poems in his most recent collection Neptune Blue, though this is the first publication which showcases his new direction towards the sun.